EN UNIVERSIDAD DE SOTAVENTO, CAMPUS VILLAHERMOSA…¡YA ABRIMOS INSCRIPCIONES! *ESTE BUEN FIN, ¡INSCRÍBETE GRATIS! *DEL 19 AL 21 DE NOVIEMBRE. *DE 8:00 AM A 8:00 PM. *INSCRÍBETE EN LAS CARRERAS DE NUESTRO SISTEMA ESCOLARIZADO Y ABIERTO. *INFORMES AL 01 993 357 04 09 Y 01 993 357 07 49 EXT 112. 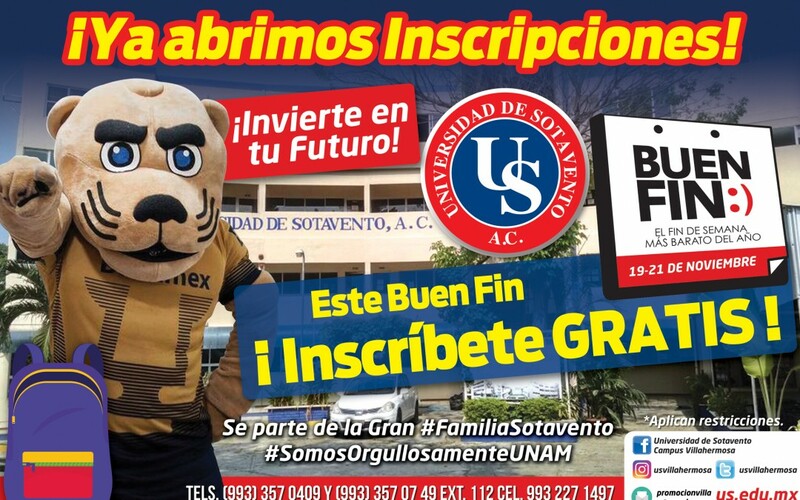 *FORMA PARTE DE LA GRAN FAMILIA SOTAVENTO!